Citation: Janeczko, P. B., & Raschka, C. (2012). A foot in the mouth: Poems to speak, sing, and shout. Somerville, MA: Candlewick Press. 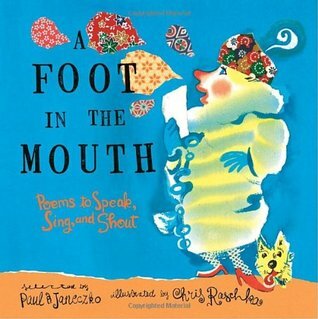 A Foot in the Mouth: Poems to Speak, Sing, and Shout by Paul B. Janeczko is a compilation of poems by various poets that are best read aloud. It focuses on the richness of a poem’s sound and highlights those works that are particularly enjoyable when heard aloud. The introduction by Janeczko explains this and encourages readers to take initiative and try their hand at reading poetry alone or with a friend for encouragement. The book itself is divided into sections for one voice, tongue twisters, poems for two voices, list poems, poems for three voices, short poems, bilingual poems, rhymed poems, limericks, and poems for a group. There is also an acknowledgements section to wrap up the book by providing more bibliographic information for each selection. Each poem is accompanied by at least one illustration. These more often resemble doodles as if the illustrator was interpreting the text of the poem quickly as it was read aloud to him. Raschka’s bright, bold, and loud illustrations give a different type of voice to each poem as if he had grabbed the sounds from the air as the words were spoken. Different styles are highlighted throughout the book with a unique feel for each poem that appealed to a young audience in different ways. Some are humorous, others nostalgic for moments in childhood, and still others slip in education moments like “An Orthographic Lament” by Charles Follen Adams. Some classics are included like “Jabberwocky” by Lewis Carroll and the witches’ scene from Macbeth. Each fits the unifying theme of richness of language and the increased enjoyment when read aloud to a young audience. on swings at the park. under the hood of a truck. I chose to focus on the opening poem in this book because it sets the scene for all those that follow. It perfectly illustrates how words can change our perception, appeal to our senses, and make us connect to a poem even more, especially when spoken aloud. Not only does it poem use imagery to appeal to every sense and make the reader fully experience the art of poetry, it demonstrates how different poems can mean different things to every reader or how poetry is not only one thing. Some poems can wrap you up in a sense of familiarity like you’ve come home (“syllables between brothers”) while others feel strange and challenging but exciting nonetheless (“squeeze your hand/on a crowded street and say/Look”). Read the poem aloud to the class. Discuss the imagery in the poem and how poems can jump off the page to make you feel things. Read Otto the Owl Who Loved Poetry by Vern Kousky and discuss how the right poem can start a love for poetry and how it makes you feel. Re-read the poem as a class and discuss the types of poems discussed (familiar, classic, fun, melodic, etc.). Have the children share poems that have touched them.